de Havilland Vampire Mk.1 'RAF, RAAF and Armée de l'Air. Development of jet fighter later to be named Vampire began in 1941 and related closely with development of H-1 jet engine, for which the engine section of de Havilland company was responsible. The engine was known later under its new name Goblin and its development was very successful. The Vampire was therefore ordered under Air Ministry specification E6/41 for an experimental machine able to be converted to a fighter plane. The design of the plane was fully adjusted to the new engine, which resulted in overall tiny dimensions of the plane, very low undercarriage and the tail planes being carried by two slim tail booms. The first prototype, unofficially named Spider Crab, flew for the first time on September 20, 1943 with G. de Havilland Jr at the controls. The trials were a success and an order for first 120 planes was placed in May 1944 and was continuously increased. The production planes were licence-built by English Electric since de Havilland was busy producing Mosquitoes. The original name Spider Crab was rejected by the RAF and changed to Vampire Mk.I. First squadrons got their Vampires in May 1945, but did not take part in the war. The development continued in further versions, besides the versions with DH Goblin engine, there were also versions with Nene engine (built in Australia), two-seat night fighter versions, two-seater training versions or naval fighter versions. 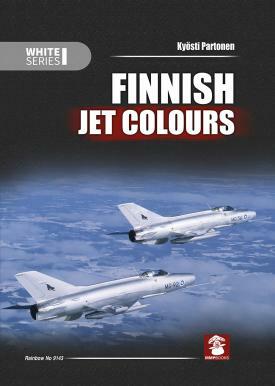 The Mk.I version was also the very first jet fighter aircraft to be used by military of neutral countries, Switzerland and Sweden. The kit’s plastic parts come on three grey styrene sprues and two clear sprues which are accompanied by a fret of photo-etches. The first clear sprue offers the standard, late type of the clear hood and also the original, early style canopy typical for the first Mk.Is. This part, however, was not manufactured to our standards, which we regret of course, and thus we have decided to rework the design completely and produce a second sprue with much more exact rendition of the early hood. Originally, the Vampire Mk.I kit was to offer schemes for just two operators of the type, the RAF and RAAF. It has been decided, however, that a new marking option will be offered in this boxing to make it more attractive for a wider range of modellers. The new addition to the kit is a quite eye-catching machine wearing French colours and the title of this boxing has also been updated. 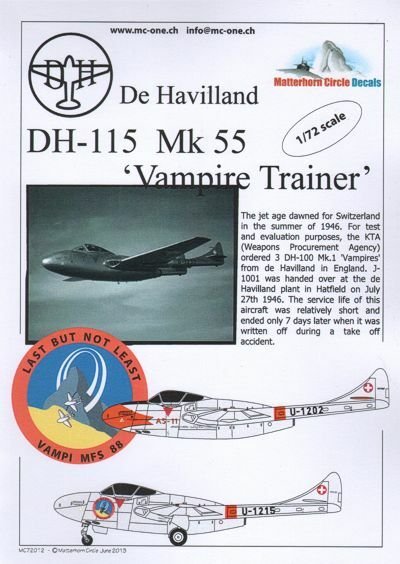 de Havilland DH.115 Vampire Trainer. 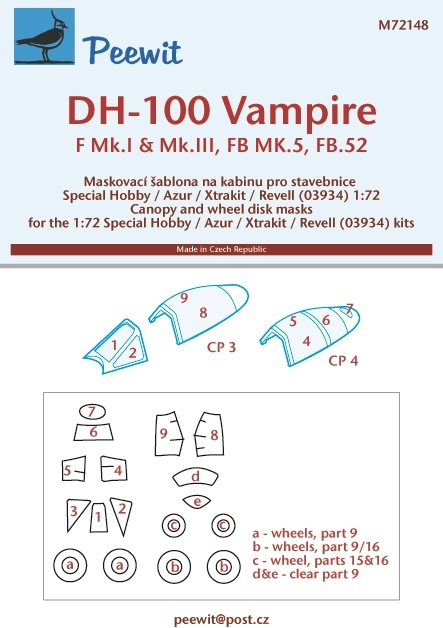 Vampire DecalVampire DecalMC48006 / MC72006Vampire InstructionsVampire InstructionsVampire InstructionsDownload PDF Download PDF Download PDF Download PDF Michel BerardMichel Berard also available in 1/72 price: 1/72 CHF 16.- 1/48 CHF 25.- Kits: 1/72 Heller / Airfix / CMR 1/48 Classic AirframesBasel 2006 - by Michel BerardMk 1Mk 1Mk 1line upPrisi booklet DH.100 Vampire / DH.115 Vampire Trainer The jet age dawned for Switzerland in the summer of 1946. For test and evaluation purposes, the KTA (Weapons Procurement Agency) ordered 3 DH.100 Mk.1 'Vampires' from de Havilland in England. J-1001 was handed over at the de Havilland plant in Hatfield on July 27th 1946. The service life of this aircraft was relatively short and ended only 7 days later when it was written off during a take off accident on August 2nd. Not to be discouraged however, the Government ordered 75 DH.100 Mk.6 'Vampires' at the end of 1948. These aircraft were to be built by de Havilland, while a further batch of 100 Vampires were to be built under license in Switzerland. Deliveries from Hatfield started on May 5th 1949. The aircraft were flown to Switzerland by de Havilland company pilots and in particular by John Cunningham, who at that time, was the company's chief pilot. For the delivery flights, small British registrations were painted next to the Swiss serial numbers which could quickly be removed in Switzerland. The aircraft were painted according to Swiss specifications and already carried service markings in French and German. 'Operation Snowball' took place on February 8th 1950. John Cunningham carried a pair of skis attached on top of the tail booms. For the delivery flight, J-1048 had the title 'Operation Snowball' painted on the engine cowling. A total of 75 DH.100 Mk.6 Vampires were flown into Switzerland serialled J-1005 - J-1079. In the meantime, the manufacturing lines for the license built DH.100's were being set up in Emmen, Altenrhein and Buochs. 100 Vampires (J-1101 to J-1200) were delivered to the Swiss Air Force between 1951 and 1953. The Goblin Engines were however still built in the UK and most of them were flown in by Swiss Junkers Ju-52s. In 1953, F+W Emmen (in co-operation with de Havilland) built 3 DH.115 Mk.11 Vampire Trainers (U-1001 - U-1003). Three years later, an additional batch of 7 Vampire trainers (U-1004 - U1010) were produced and on this occasion the Mk.55s were equipped with Martin-Baker Mk3 ejection seats. In 1957 however, these aircraft were re-serialled U-1201 - U-1210. By 1967, a total of 39 DH.115 Mk.55 were being flown by the Air Force, the last 9 of them being surplus RAF aircraft.